Good things come from the heart! - Sofitel Darling Harbour Opening - We were there! What an amazing personalitly, what a fantastic cause! Dr. Jerry Schwartz, hotelier and philanthropist was interviewed by the gorgeous Rebecca Valastro today for the big opening of the new and exciting 5 star hotel Sofitel Darling Harbour. The entire hotel has been donated to 33 charities for the night, such a wonderful cause!! Ivy&I was excited as the gorgeous producer and interviewer Rebecca Valastro was wearing Ivy&I jewellery at the event. A bit of sparkle up high in the sky. I must admit, after I had finished this very special ring I was in trouble! I wanted one for myself. oh dear! It's official!!! Thomas and Jo and their two gorgeous boys Louis and Harry recently travelled to Gent in Belgium where they tied the knot in style. It couldn't have been a better day or any more special, with all their closest friends and family celebrating along with them. Jo looked uber chick in her stunning wedding dress and Thomas was the handsome partner in crime, what a perfect match. Thanks Thomas and Jo for choosing Ivy&I to hand make your engagement ring and wedding bands. We can't be happier for you both. Here is our newest creation, some precious ruby and diamond studs for our lovely Georgia. These earrings were originally a yellow gold ring, a family piece which got handed down to Georgia. As the stones hold great sentimental value but the ring wasn’t quite her ‘cup of tea’, she decided to remodel it into a funky pair of earrings, they look great! I always wanted to build my own house - well, here we go - done and dusted! Those two pendant are handcrafted for two very special women - our mother's. Thank you for all the love and support, always. Thanks for being so wonderful! The perfect clip to hold your paper together - so cool, so personal, just hip! These are not for everybody and that is exactly what we want - stand out with new and different pieces. Just in time for spring. 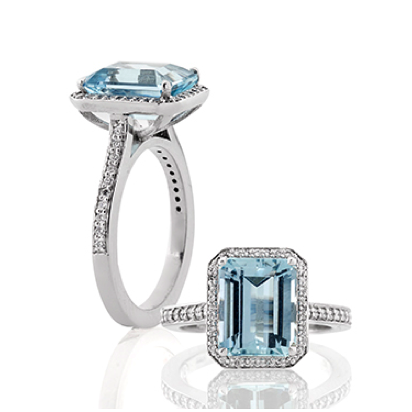 Get dressed with aquamarine and diamonds. Our latest creation - just so simple and timeless! In the workshop - Sara’s special ring is coming to life whilst Miguel is snapping away and documenting every step of the process - so much fun! Ivy & I just finished our stylish and funky bangle called STYLO inspired by one of Ivy's favourite toys. Pick a colour, we make one for you! This year the Vivid Festival has been absolutely spectacular; brilliantly executed by the City of Sydney - it is definitely one of our favourites. To celebrate the event, Ivy&I have been working away in our studio creating a new "VIVID" edition, influenced by the enchanting lightshows.